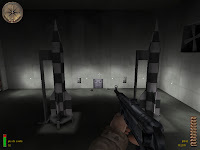 You must infiltrate a top secret underground launch facility for V2 rockets and stop the launch. So here we go with the fist Medal Of Honor experience, it's a pretty basic one with a major objective and 3 additional (not necessary) small ones. Design is a compilation of room and hallways pretty basic with limited environement (storage room, office, training room, generator room,...) squale is ok like the layout. Enemy placement is well put together to give some limited challlenge. Progression is straight forward but with different route, it will make you progress from floor to floor till the launching bay. 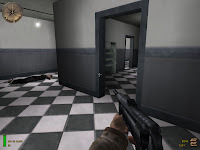 Gameplay is mostly oriented to kill enemies and fix the alternative objective (recovering papers) until the final objective, everything is basic without no puzzles or heavy fights. In conclusion: I won't consider this one like a great one, the author manage to put things together in a limited way, but for what was done it was well done. It won't give you a lot of challenge but except its tiny size and simple objective features there is nothing to complain about, so just make a rush in t for less than 10 minutes and if you don't expect to much it will be an honorable expeirence.